Following the 1848 establishment of Fort Kearny three miles east of here and the later expansion of overland commerce and emigration, the small commercial center of Kearney City was established near here in 1859. The town's more common name, Dobytown, was derived from the resemblance of its twelve to fifteen earthen buildings to adobe structures. Dobytown itself developed in response to the thousands of soldiers, freighters and travelers whose "needs" could not be met within the fort. Gambling, liquor and disreputable men and women were its principal attractions. One of the town's most famous visitors, General William Tecumseh Sherman described the horrible whiskey he was served here as "tanglefoot." 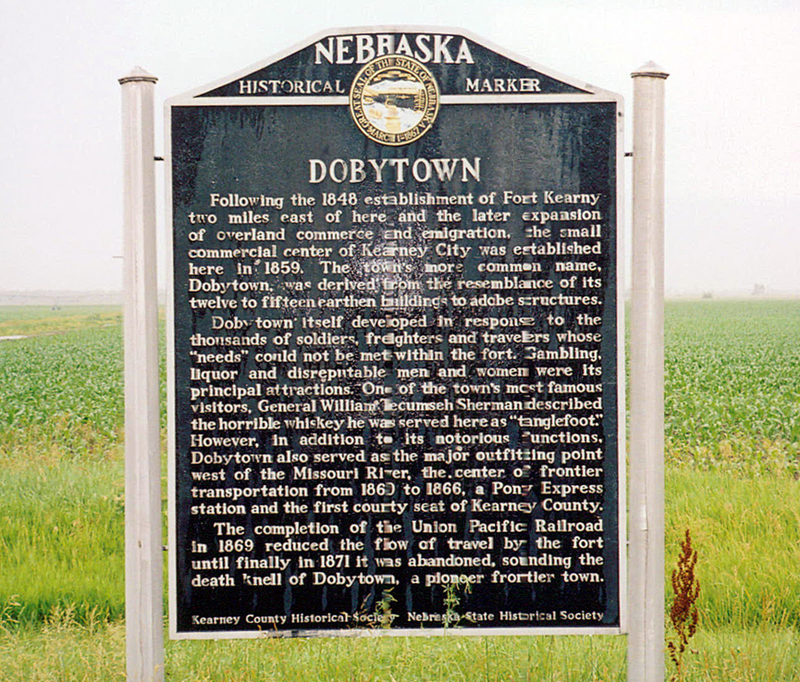 However, in addition to its notorious functions, Dobytown also served as the major outfitting point west of the Missouri River, the center of frontier transportation from 1860 to 1866, a Pony Express station and the first county seat of Kearney County. The completion of the Union Pacific Railroad in 1869 reduced the flow of travel by the fort until finally in 1871 it was abandoned, souncing the death knell of Dobytown, a pioneer frontier town. “Dobytown,” Explore Nebraska History, accessed April 19, 2019, https://mynehistory.com/items/show/295.